Borophene remains hard to make in even small quantities. If and when it can be scaled up, manufacturers will likely want to fine-tune it for applications. What the Rice and Northwestern teams learned will help in that regard. Graphene takes a single form – an array of hexagons, like chicken wire – but perfect borophene is a grid of triangles. However, borophene is a polymorph, a material that can have more than one crystal structure. Vacancies that leave patterns of “hollow hexagons” in a borophene lattice determine its physical and electrical properties. Yakobson said there could theoretically be more than 1,000 forms of borophene, each with unique characteristics. “It has many possible patterns and networks of atoms being connected in the lattice,” he said. The project started at Hersam’s Northwestern lab, where researchers modified the blunt tip of an atomic force microscope with a sharp tip of carbon and oxygen atoms. That gave them the ability to scan a flake of borophene to sense electrons that correspond to covalent bonds between boron atoms. They used a similarly modified scanning tunneling microscope to find hollow hexagons where a boron atom had gone missing. Scanning flakes grown on silver substrates under various temperatures via molecular-beam epitaxy showed them a range of crystal structures, as the changing growth conditions altered the lattice. Yakobson’s team used first-principle simulations to determine why borophene took on particular structures based on calculating the interacting energies of both boron and substrate atoms. Their models matched many of the borophene images produced at Northwestern. The researchers confirmed through their analysis that borophene is also not an epitaxial film. In other words, the atomic arrangement of the substrate doesn’t dictate the arrangement or rotational angle of borophene. 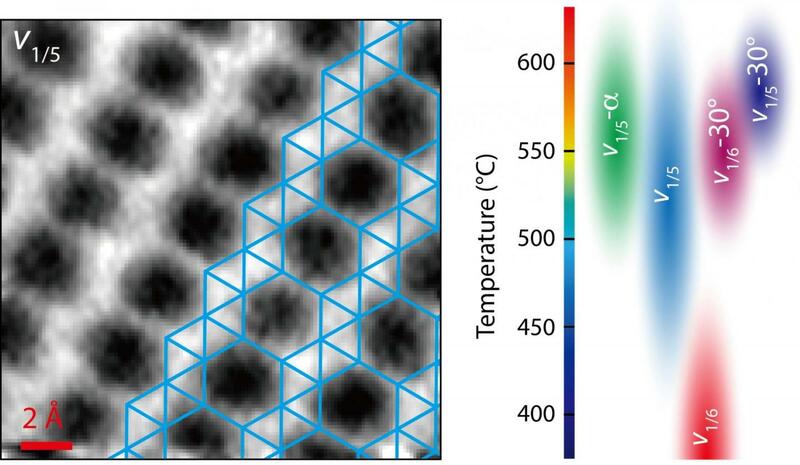 The team produced a phase diagram that lays out how borophene is likely to form under certain temperatures and on a variety of substrates, and noted their microscopy advances will be valuable for finding the atomic structures of emerging 2D materials. Xiaolong Liu of Northwestern and Luqing Wang of Rice are lead authors of the paper. Co-authors are Shaowei Li and Matthew Rahn of Northwestern. Yakobson is the Karl F. Hasselmann Professor of Materials Science and NanoEngineering and a professor of chemistry at Rice. Hersam is the Walter P. Murphy Professor of Materials Science and Engineering at Northwestern. The Office of Naval Research, the National Science Foundation, the Department of Energy Office of Science and the Northwestern University International Institute for Nanotechnology supported the research. Read the paper at https://www.nature.com/articles/s41467-019-09686-w.